The best welding jacket should be made to withstand the heat and harmful lights that emanate from the task. In this regard, it should feature tough materials such as leather. At the same time, the material should not be too rigid to impede you from executing your duties appropriately. Look at several welding jackets in the market today and invest in the jacket that best suits your welding routine. We always have your success in mind when bringing these reviews. The following products have been chosen from a pool of many welding jackets. They appear here because they have been proven for efficiency, durability, and ultimate protection. As your health is your wealth, do not continue exposing your body to danger. Instead, invest in one or two jackets now and enjoy a hazard-free welding and plasma cutting experience. Do you want to look good when doing your everyday heavy metal fabrication? Obtain the Black Stallion Welding Jacket today and get admiration from your co-workers. It features a good-looking black blueprint with red flame stripes running down the chest and the sleeves. Good-looking is not the first characteristic of a welding jacket, but the fact that Black Stallion have managed to fuse that with ultimate protection is impressive. The jacket is made of 100% leather with the inside featuring a nice lining for your comfort. This ensures you feel good about yourself when welding as the exterior repels heat, ultraviolet rays, and infrared light. You will fall in love with the adjustable waits straps and cuffs. Similarly, it has a collar to protect your neck against sparks. The flame and heat resistant welding jacket weighs 1.5 pounds. The Hobart leather welding jacket is extra large to shield your arms, thorax, and abdomen from harmful conditions in your workshop. Be sure to take it with you when going to fabricate metal outdoors. It is made of cowhide leather to ensure maximum shielding all the time. 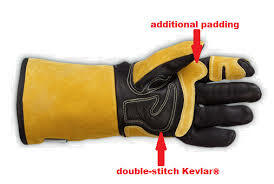 The seams are joined together using heavy duty stitching while the snaps are reinforced for added security. Regarded by many as one of the best welding jackets today, it weighs 11 pound and measures 15.9 inches in height, 12.6 inches in length and 3.4 inches in width. It is a stylish brown leather jacket for use in all welding scenarios- vehicle body shop, light construction, industrial metal fabrication, and light domestic works. Use it to protect yourself from spatter, sparks, and molten metal. Lincoln Electric has been in the forefront of manufacture of plasma cutters, welding equipment as well as protective apparel. Their K2989 is made of a heavy-duty cowhide leather material, and features prominently on many best welding jacket reviews. It is a large size stylish black jacket made to withstand the rigors of all types of metal fabrication. You will like it because it has an inside pocket where you can keep a mobile phone or a welding accessory. The only drawback may be the fact that it weighs 5 pounds. However, this should not be a major snag because it compensates for the heavy weight by protecting your body effectively. If you are an enthusiast of stick welding, you will find this jacket most appropriate. This is because it has side split sleeves and padded chest to add excellent protection to the game. Secure the collar with the hook-and-loop mechanism and fasten the front closure with a series of snaps. Wear it all day and remain comfortable while doing serious welding. Ensure you wear it with other protective clothing. You know Miller as a respected manufacturer of welding equipment, plasma cutters, service parts, and accessories. To add on to their impressive portfolio, the company makes interesting protective apparel for use when fabricating metal. One such item is the Miller 244754 Welding Jacket that can be used virtually by anyone anywhere. 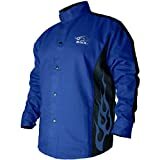 It is rated among the best welding jackets. Take advantage of the sleeve snaps that employ the fold-in technology. Your wrists will fit comfortably for better handling of equipment. In addition, there is a high visibility Miller logo emblazoned on the front of the jacket. Now you will avoid accidents because you are clearly visible to your colleagues. While it weighs 2.2 pounds, it is made of 9 oz. cotton that is flame resistant.